Cluedo Classic slot machine is the second Cluedo title from IGT and is of course based on the famous board game from Hasbro that features the likes of Colonel Mustard and Professor Plum. A very simple slot to play, it has 5 reels, and 20 paylines, but where it really comes into its own is with the jackpot, which tops out at a huge 30,000x line, when in the free spins round. The free spins bonus also offers up to 15 free spins and a 3x mulitplier. Check out the Cluedo Classic slot review below for all the details. If you fancy yourself as something of a sleuth, now’s the chance to put your money where your mouth is in IGT’s Cluedo Classic slot – a five-reel video slot based on the murder mystery board game. Featuring a range of recognisable characters from the original Cluedo set, IGT slots’ version sees you traipsing round Tudor Manor on the hunt for clues as you spin your way to maximum jackpot of 10,000x your line bet. Also boasting a free spins feature in which players can bag themselves 15 games with a 3x multiplier, it won’t take a detective to figure out the slot has huge payout potential. Available to play across all desktop, mobile and tablet devices for as little as £0.01 per spin, the game benefits from substitute wilds that can be used to complete additional winning paylines, while scatter symbols are also on hand to ensure players get plenty of bang for their base game buck. 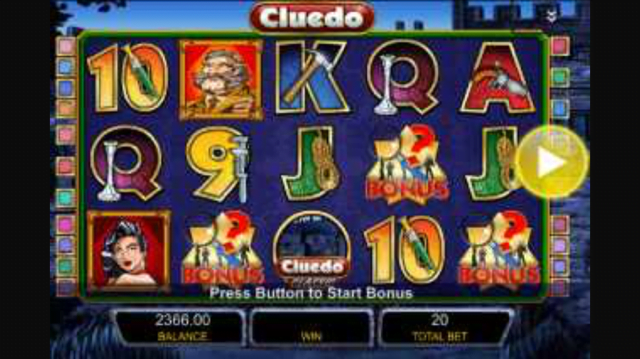 A relatively simple game, the Cluedo Classic slot machine includes just one bonus feature – but thankfully it is a good one that is capable of paying out some bankroll-boosting wins. Triggered whenever three or more mystery symbols appear on the base game reels, players will instantly receive a cash prize based on their number of triggering symbols before being awarded an additional 15 free spin games. During this feature the value of all winning paylines is tripled – which means there’s a staggering top award of 30,000x your line bet up for grabs on each spin – while three additional mystery symbols will retrigger the feature up to a maximum of 180 consecutive games. Taking this into account, the game has a return to player stat of 93.65%-96.46%, making it a relatively low variance title overall. With all this in mind, the Cluedo Classic slot is a great way to enjoy all the fun of Hasbro’s iconic board game without wrongly accusing grandma of a murder most foul and triggering years of family resentment. An incredibly straightforward slot to play, Cluedo Classic slot nevertheless ticks all the right boxes in terms of its paytable and bonus features to create a truly unmissable slot for all board game fans. Like the Cluedo Classic slot review? Check out these as well…..